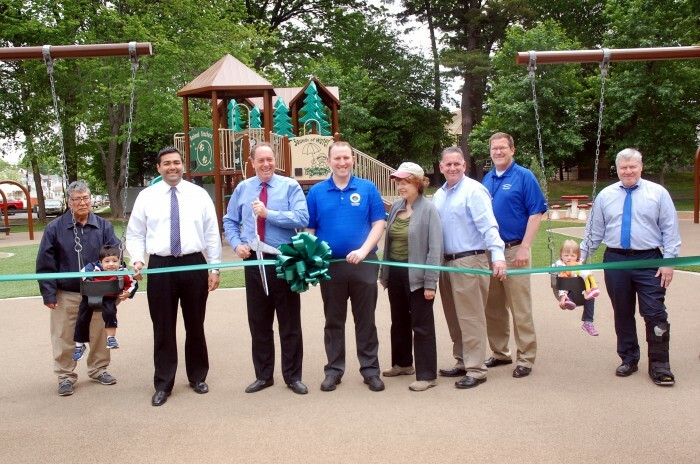 The Union County Board of Chosen Freeholders today cut the ribbon on a new playground/sprayground in Warinanco Park in Elizabeth. The new facilities are located across from the Boat House and include the playground, sprayground (which has more than 100 spray jets) and is the seventh sprayground to open in the County parks system; new basketball and volleyball courts and renovated restroom/concession buildings. to r. Anibal Sedano, of Elizabeth, with his grandson, Adam Sedano; Freeholder Sergio Granados; Freeholder Vice Chairman Bruce Bergen cutting ribbon; Freeholder Chris Hudak; Freeholder Bette Jane Kowalski; Elizabeth Third Ward Councilman Kevin Kiniery; Parks Director Ron Zuber; Ellie Wilson-Newbury; and County Manager Al Faella.